Joyous Season's Greetings from WarcraftPets! 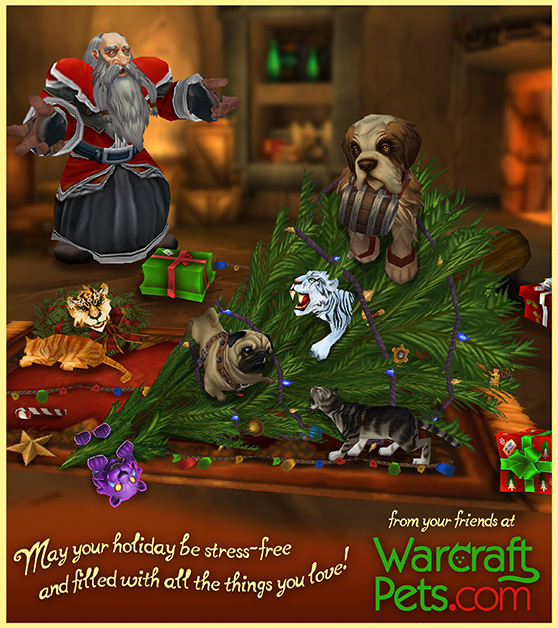 Warmest holiday wishes from all of us at WarcraftPets! Have a stress-free and safe holiday, plus a fun-filled Feast of Winter Veil! The first four pets can drop from the [Gaily Wrapped Present] found under the Winter Veil trees in Orgrimmar and Ironforge beginning on December 25th. The next four can be obtained through the "You're a Mean One" daily quest. Last but not least, the Grumpling drops from lootable Snow Mounds in the Winter Veil daily quest area in Frostfire Ridge, Draenor. Thank you for continuing to support WarcraftPets over the years. It has been an honor to serve the pet collecting community throughout 2016, and we look forward to bringing you the latest Pet Battle information in the new year. We wish everyone a prosperous and pet-filled 2017! About the Artist: Ooghra (Erin Gomez) is a long-time pet collector and WarcraftPets user. She's a talented graphic artist and we've previously featured her amazing creations in our 2016 April Fool's and Pet Battle Royale series! Happy Holidays everyone! Thanks to WarcraftPets for everything you do. Looking forward to more pet adventures in 2017!